If you're a regular reader of my blog, you'll remember my trip to Schaumburg, IL for Stitches Midwest this past August. While there, I snagged some really cool yarns. I went knowing I only wanted to buy yarn that I couldn't buy near me, and came home with this beautiful light sport weight yarn varying from white to dark blue. I was very curious to see how it would work up, and started with this shawl pattern: Summer Flies Shawl. 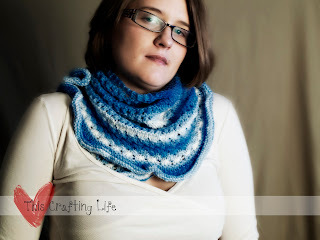 I found it on ravelry one day and liked the way it laid, just as a collar piece, and I love it. It was really fun to work up, with the varying pattern stripes, and the color just worked up beautifully! I think the only thing that I would change for myself would be the way the end curls and ruffles. I almost wish that it laid more flat. I also probably would have gone up another needle size or two, as I like the looser look a little better and this worked up pretty tightly. I think mine is actually a little smaller than the original. Overall, this is a great pattern, was fun to do, easy to understand and I love the way it came out! 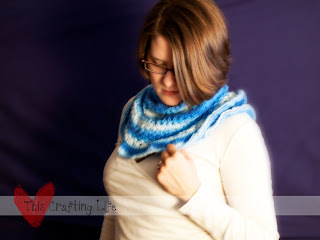 I went back recently to discover that this pattern was no longer available for free, which is a major bummer!! It's still a pretty good bargain at only $1.85, but if I had to pay for it when I made it, I probably wouldn't have made it and gone for something else.